Also known as Dimorphs, this group is the largest and most wide ranging of all of the animal groups on Rona. It is equivalent in size and diversity to vertebrates on earth and shares with that group, an internal hard skeleton found in most members. However the ploidomorphs are nested within an even larger group, the Chakorrakta which is defined as all animals with a hard internal skeleton. The Chakorrakta also includes the Ordina. Ploidomorphs are characterized by a two stage life cycle. In the first stage the individuals are usually fairly large and have two sets of chromosomes just most animals we are familiar with on earth. This is the diploid stage and is termed the Traform or "main form". However insted of being male and female the Traform are unisexual and all individuals produce large numbers of very small offspring in packets of eggs. These offspring have only one set of chromosomes each and are termed gametoforms. They look almost nothing like the parents. The eggs of these packets to hatch become sexually mature, grow wings and search for a mate. They live colonially like ants, bees or termites with the mated female serving as the "queen" to produce asexual workers. Depending on the species Dimorph colonies might live in the ground or in trees. A few species retain their wings and live as a bee or wasp colony would. The mated female grows in size and eventually produces a small version of the first stage of the creature which then, depending on species, grow up on it's own or is 'adopted' by adults in the first stage. The other division of this group has extremely reduced haploid stage which can sometimes be microscopic. 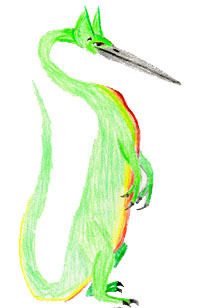 The Kalorinae are the "typical" subgroup of Ploidomorphs with relatively large, long lasting gametoforms. This group is the most diverse on land, though there are a few aquatic genera. It is thought the Kalorinae represent the ancestral type of reproduction in ploidomorphs. The steel-hide is so named because of it's thick, tough hide that is near ly impenetrable except to the talons of a Pharlan. It is also called the Gakra'Rek. It is probably the most d angerous creature on Rona because of it's aggressive nature and extreme size, strength and power. It is comparable to the hippo and rhinoceros on earth but is a much faster runner. The steel hide is a very intelligent creature roaming the plains, forests and even deserts in family groups. It's weaponry includes the three horns, spikes on the back of its rear legs- good for slashing at predators approaching from behind, and quills on the tail and head. With these weapons the steel hide is be more than a match for most predators on Rona. There are varieties of Steel hide found in nearly every environment on Rona. The largest is the Savannah version which is the one pictured above. The gametoform of the steel hide is called Halave. They are a 3 inch antlike creature which live in colonies. These are produced from the egg cases laid by all Gakra'Rek. Each egg case can contain around 5000 eggs about the size of a BB or large salmon Roe. Each gakra rek will lay around 10 to 12 egg cases in a season. Eggs are produced in midsummer in most species and usually hatch within a few weeks, depending on conditions. The eggs are also capable of entering a state of dormancy when conditions are poor and can survive for around 10 years buried in soil. The queen produces all of the members of the colony as haploid near clones of herself. Once the queen has grown to a certain size, the development of the diploid Gakra'Rek will begin inside of her body. Halave colonies are typically very voracious in finding food to support the nascent Gakra'Rek. Newborn steelhide normally emerge from the underground colony at a synchronized time, usually late spring. The emergence usually involves breaking out of the remainder of the queen's body. Sometimes the colony will die after this but occasionally the queen will produce a diploid clone of herself and the colony will continue. The newly emerged Gakra'Rek is usually about the size of a small dog and is almost completely covered in quills which harden a few hours before they emerge from the ground. Because of the synchronized emergence, they normally form small herds and will usually eventually meet up with a group of mature size Gakra'Rek. The Lora is a specialized predator of the plains. Their diet consists almost exclusively of Injis. They hunt by using their incredible hearing to hear the Injis moving in their tunnels. Once located the Lora stabs it's beak into the earth and more often than not comes up with a meal. The lora has few physical defenses against predators so, it's main wepon is bluffing. When attacked it rears up on it's hind legs and display's it's brightly colored underside. It then hisses and strikes out like a snake. If this fails to deter a predator it will emit a foul smelling odor. There are several related species of lora. The Gametoform of the Lora is the tigal. Tigals are winged at maturity, and normally feed on nectar but will also drink blood from birds and mammals at critical stages of the nascent lora's development. The Nerorinae are the most typical aquatic form of ploidomorph. They often appear fishlike and breath through the use of gills. Unlike the Kalorinae their gametoforms are usually short lived and non-colonial. This form of reproduction is thought to be more derived and efficient in an aquatic environment. There is considerable variation in the amount of gametoform reduction between groups within the Nerorinae. The Gametoform of the Tsagor is relatively reduced and sexually dimorphic. Females are sedentary soon after hatching, last longer and reach a larger size feeding by filtration and are also supported by symbiotic microorganisms living in their tissues. They resemble a terran tunicate once sedentary and a tadpole bfore. The female Galiga reaches the size of a tennis ball over a period of about a month. After this time the small Tsagor escapes the body of the Galiga, killing it. Male Galiga are much smaller and last only a few days, their only purpose being to find a mate.